The Davis Art Gallery is currently hosting an exhibition of the work comic artists. Since the gallery is on the same floor as our offices, I get to see the artists’ works every day. Naturally, I’ve since become more aware of caricature and cartoon art in the Davis Art Images collection. This genre of art has been around a long time, but nowhere is it a more fascinating sidebar to history than in Mexican art from the turn of the twentieth century. 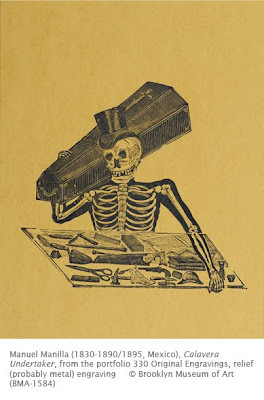 Two artists are known for their cartoons of the calavera (skull), Manuel Manilla (1830-1890/1895) and José Guadalupe Posada (1852-1913), who is sometimes unjustifiably credited with “inventing” the theme. Indeed, Posada may have been a protégé of Manilla. Under the harsh dictator Porforio Diaz (1830-1915), many illustrated journals and broadsides nurtured the flourishing of satirical art, despite the threat of retribution by Diaz’s regime. These publications criticized the corrupt government, wealthy aristocracy, and the social abuses of the Roman Church. The most famous cartoons to emerge from this nascent period of the Mexican Revolution (began c1910) were those depicting the calavera (skull figure). The calavera theme dates back to ancient Mexican societies which, in yearly rituals, mocked Death and its supposed hold over humanity. The Spanish conquerors at first tried to quash such ceremonies, but it soon became part of All Saints Day (November 1st), also known as the Day of the Dead. Little is known about the life of Manuel Manilla. He began producing prints in 1882, making approximately 500 engravings in the service of Antonio Vanegas Arroyo in Mexico City. These prints had to do with various elements of the Mexican middle class, including the circus, bullfighting, magic scenes, and the Virgin Mary. An artist of the people, sharing concerns about the corruption of the Diaz dictatorship, he began to popularize the calavera prints in the late 1880s. Originally produced for the Dia de los Muertos, Manilla conceived of the calavera as the traditional leveler of society, proof that all people are equal, no matter what their station in life. He depicted the calavera interacting in every aspect of Mexican society. His work surely was an influence on the more famous Posada, who began working for Arroyo in 1892. In a broader sense, the image of the calavera is fascinating because it is practically a universal image in art of the western world. The subject of Death confronting people from every station appears in the Death Dance cycles of Europe (particularly northern Europe) in the Middle Ages (c1000-1400), which continued to be popular through the Renaissance period (c1400-1600). The calavera images of Manilla and Posada were a great influence on the art of the Mexican muralist such as Diego Rivera (1886-1957), who viewed the subject as an artistic bridge of subject matter between the ancient native Mexican cultures and the Spanish conquerors. The strong tradition of graphic arts in Latin America, in which Manilla played a key role, would also nourish many subsequent printmakers, most notably those who formed the Taller de Gráfica Popular (Peoples Graphics Studio) founded in Mexico in 1937.